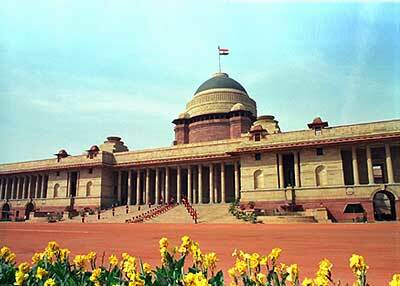 President House i.e Rashtrapati Bhavan (a sanskrit word) is the official residence of the President of India, located in New Delhi. The splendour of the Rashtrapati Bhavan is multi-dimensional. It is a vast mansion and its architecture is breathtaking. More than these, it has a hallowed existence in the annals of democracy for being the residence of the President of the largest democracy in the world. Few official residential premises of the Head of theState in the world will match the Rashtrapati Bhavan in terms of its size, vastness and its magnificence. The present day Rashtrapati Bhavan was the erstwhile residence of the British Viceroy. Its architect was Edwin Landseer Lutyens. The decision to build a residence in New Delhi for the British Viceroy was taken after it was decided in the Delhi Durbar of 1911 that the capital of India would be shifted from Calcutta to Delhi in the same year. It was constructed to affirm the permanence of British rule in India. This building gave the impression, in the words of a critique, the setting of a perpetual Durbar. The building and its surroundings were supposed to be ‘an empire in stone’, ‘exercising imperial sway’ and containing in it, “the abode of a disinterested elite whose rule was imposed from above”. You can see satellite picture using Google earth or live picture using Google map. Remember your first lesson in life or lesson that changed your life. It is your teacher. In India 5th September is celebrated as Teachers’ day. On the eve of teacher’s day I would like to just wanna say one think “Don’t ever forget your teacher”. They mold your life. Lesson learned from teacher remain with you throughout life. No matter what happens you should always respect your teachers. 5th September is the birthday of a great teacher Dr. Sarvapalli Radhakrishnan. When Dr. Radhakrishnan became the president of India in 1962, some of his students and friends approached him and requested him to allow them to celebrate 5th September, his “birthday”. In reply, Dr, Radhakrishnan said, “instead of celebrating my birthday separately, it would be my proud privilege if September 5 is observed as Teachers’ day”. The request showed Dr.Radhakrishnan’s love for the teaching profession. From then onwards, the day has been observed as Teachers’ Day in India.